Reception for Jessica, First Friday, September 7th, 5 to 7pm. Jessica Lee Ives (nèe Stammen) grew up in Camden, Maine. She received her BFA from the renowned Cooper Union School of Art and was named one of Glamour Magazine's Top Ten College Women of the Year in 2003. After September 11, 2001, Ives worked as an artist-in-residence at Ground Zero in New York City, which earned her the Clark Foundation Fellowship, with which she pursued her MA at NYU, combining work in the fields of art, religion, and public service. Ives moved back to midcoast Maine in 2008. In 2014, Ives transitioned into full-time studio practice. Today she maintains a vibrant online presence through her website, blogs, and Instagram. "Immersed in Nature" is Ives' first solo show with Gleason Fine Art in Boothbay Harbor. For the show, Ives focuses on three activities that she has explored extensively, both in person and in paint: swimming, mountain climbing, and fly-fishing. In both the soaring beauty of her Katahdin painting "Joy Is the Lesson" and the graceful underwater ballet of "Choreographic," Ives demonstrates her deep respect for the natural world. With "Evening on the Big Eddy," a solitary figure casts a line into a gorgeous, immense, deep-blue river. The moment is peaceful, reverential. The viewer can feel what it's like to be there--alone in nature and totally at peace with it and yourself. 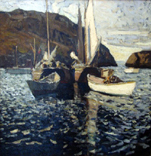 As a painter, Ives works in a loose but representational style. As an individual, Ives is both thoughtful and spiritual. Through her painting, Ives seeks to express her relationship with nature, as experienced simply through the act of seeing, and more directly through the many recreational activities in which she engages. On a personal note, gallery owners Dennis and Marty Gleason have known Jessica since her college days, when she interned one summer at a second gallery they ran in Camden at the time. From her first tentative painting efforts to her current masterful handling of large, complex figural works, it has been thrilling to watch Jessica evolve as an artist.